LG today announced the V20 at an event in San Francisco. The handset is a follow-up device to last year's V10. The defining feature of the V series is the Second Screen, a small, always-on display that sits atop the main display on front. The Second Screen can be used to serve notifications as well as access app shortcuts and other content. LG picked aluminum to form the frame and a silicon-based material for the back panel. LG says this silicone polycarbonate is found in helmets and reduces shock. It helped the device earn a mil-spec rating of 810G for protection against drops. The V20 features a 5.7-inch quad HD display, Snapdragon 820 processor with 4 GB of RAM, 64 GB of storage, and memory card slot. The phone includes several cameras, including a 16-megapixel rear camera with f/1.8 aperture and optical image stabilization. The phone also packs a secondary 8-megapixel rear camera with 135-degree wide-angle field of view and an f/2.4 aperture. The selfie camera has a 5-megapixel sensor with f/1.9 aperture. Other camera features include 4K video capture, high-fidelity sound capture, Steady Record 2.0 electronic image stabilization to minimize video shaking, and hybrid autofocus, which is a combination of laser-assisted and phase-detection autofocus. LG claims the V20 is the first phone to ship with a 32-bit, Hi-Fi quad DAC to reduce distortion and ambient noise, as well as support lossless music formats. The phone features Qualcomm's X12 LTE model for CAT12 at speeds up to 600Mbps (network dependent) in addition to Bluetooth 4.2, WiFi, GPS, and USB Type-C. The 3,200mAh battery is removable and supports Quick Charge 3.0. The V20 includes a fingerprint scanner for biometric security. The phone will be the first to ship with Android 7 Nougat and a new search tool from Google called In Apps. The In Apps tool will be accessible from the Second Screen so app search is always under your thumb. The V20 introduces LG's fifth-generation user interface, which LG says is an upgrade from the UI seen on the G5 earlier this year. The LG V20 will be available in Korea starting this month followed by other regions over time. The V20 is LG's biggest, most advanced Android smartphone to-date. 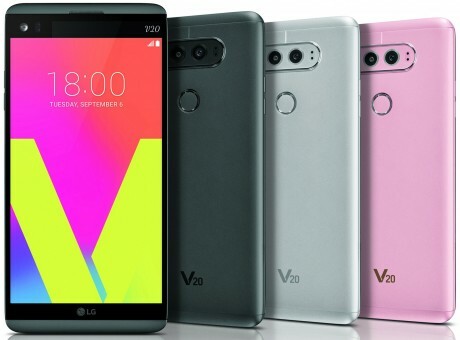 The V20 boasts three cameras, a quad HD screen, superior audio capture, and the interesting Second Screen display.